« Ferrous Metals… What’s All the Fuss? Scrapping your car in Manchester? The time has come… You’re finally ready to say goodbye to your old banger. But if you’re thinking about scrapping your car, there’s loads of options available to you. Where should you go? What price could you get? Well, we’re here to help! From the companies that’ll charge you to have your wheels whisked away, to the companies that’ll buy it from you in any condition… Whatever you choose, you’ll always want the most convenient and cost-effective service you can get. You’ll also want to make sure you get the most money for your old motor. There’s a boatload of reasons why J Davidson fit the bill, so today we’ll present to you 5 of the very best. We base our prices on many different factors, from the make and model, to the year of registration. We even consider if your car’s got alloys or not, because the more metal, the better! Our prices are always up to date with the industry and among the most competitive around. We also keep an eye on what everyone else is offering, so you can shop around but it’ll be hard to beat us! 2. We’ll pick it up for free! So many other companies are cheeky enough to charge a collection fee. They’ll actually make you pay just for the privilege of giving you their car! We don’t charge anything for this part of scrapping your car, because we believe in encouraging our customers to recycle their metal by making it as convenient as possible. As an authorised treatment facility for the safe disposal of end of life vehicles, you know that you’ll be leaving your old car in good hands. 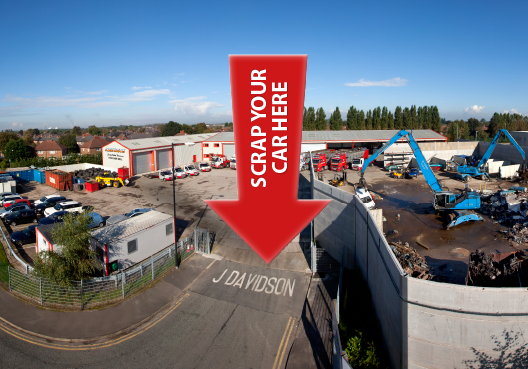 When scrapping your car at J Davidson, you know that it’ll be safely scrapped in an environmentally friendly way. Each and every part will be de-polluted, including the tyres, oils and the tricky battery. All recycling work that we carry out is compliant with government legislation, so you can scrap your car with peace of mind. 4. It’s safety first at J Davidson! For us, it’s not just about compliance and eco-aware decommissioning of cars. We also make sure the vehicle is removed, transported and recycled safely, for customers, staff and anyone else that will deal with the car’s individual components in the future too. By collecting the cars, we also enjoy helping to keep the general public safe too. We’ll collect from your house, your work or even come and pick you up from the side of the road, all so you don’t have to face the challenge of moving a non-roadworthy vehicle. … So you don’t have to! We’ll help you avoid any unwelcome visits from the DVLA or other vehicle authorities by helping you ensure that the right people are notified once your vehicle has been destroyed. Not only are we licensed to scrap cars, we’re also able to issue you with a DVLA Certificate of Destruction in exchange for your logbook. This will ensure you don’t face any additional costs once your vehicle is done and dusted. If you’re ready to scrap your car, give us a call on 0161 928 9981. This article was posted in Scrap your Car in Manchester, Scrapping your Car. Bookmark the permalink. Follow comments with the RSS feed for this post.Both comments and trackbacks are closed.